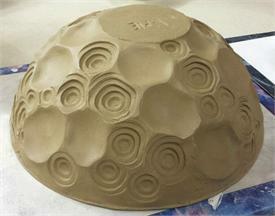 Texture Spheres offer a new way to decorate clay slabs, or even wheel thrown items! These unique tools are one of a kind! They are all hand made individual designs. and are casted by hand in the USA. Not plastic molded. They do not stick to clay. Each sphere gives you unlimited control and uniqueness of design. Use them as a stamp, roll them straight, or roll them in winding patterns to create a unique look every time you use them. Great for kids, and student, or for people with motor control disabilities. Easy to roll, easy to use. Awesome results!! Choose from the patterns below. 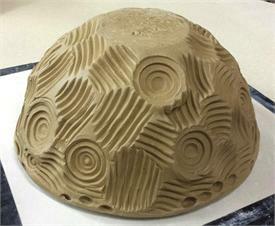 SUPER TEXTURE BALL DEALER BRACKER'S GOOD EARTH CLAYS. Bowls pictured at the top of this page created by Jamie Meador.